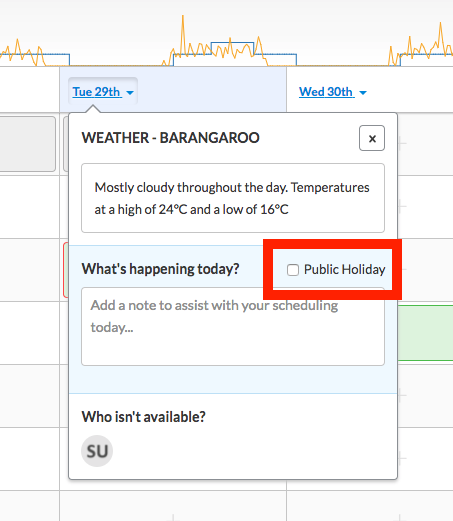 Public holidays are marked in your scheduling page, so you can schedule with public holidays in consideration. Public Holidays in Deputy are used to pay your employees their public holiday rates, as set in your payroll system and by editing employees on the People page in Deputy. Making a day a Public Holiday will apply their PH rates instead of their weekday or weekend rate. To create a public holiday in Deputy you must be either a Location Manager or System Administrator, as otherwise you will not be able to access the required options. If a day is marked as a Public Holiday, it will be marked as such for all of your locations. If you need to split them into different locations or areas, follow our instructions here. This will not automatically pay full-time staff who do not work. This is best handled manually in your payroll system. If you have already approved timesheets before marking the PH, the regular rates have been applied rather than your PH rates. To apply PH rates you will need to unapprove the timesheets then approve them again. First, go to the Scheduling tab. Next, navigate to the day you would like to mark as a public holiday and click the dropdown button. You will see the Public Holiday option displayed. Click it to mark the day as a Public Holiday. You can remove the PH by clicking it again. After marking a day as a Public Holiday you'll see the day marked in red, as shown below.